If your children have ever had lice living on their heads, you probably know what an absolute pain it can be to get rid of them. There is the nonstop drying, vacuuming, and ensuing back pain that seems to go hand in hand when you pick out all those little nits. 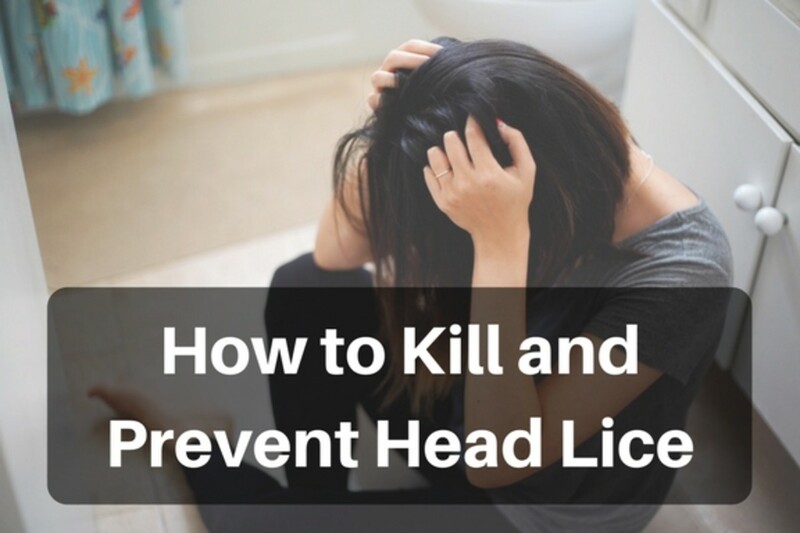 Fortunately, there are a few steps you can take to help prevent your child's head from becoming infested with lice. 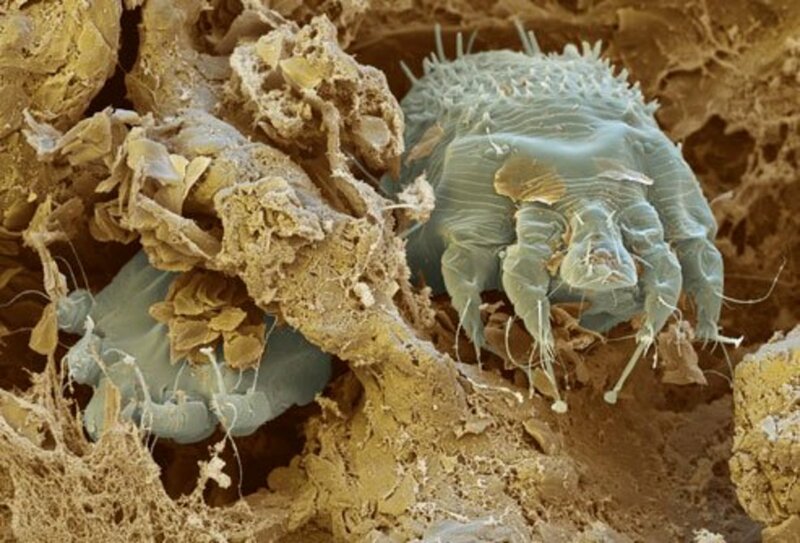 As you begin this battle, the good news is that having lice, or pediculus humanus capitis, is not a sign of uncleanliness—they can be easily contracted through contact with any kid of all ages and classes. Also, lice don't carry diseases, which is good news. He also emphasizes that, though panic is a natural response for a parent who discovers their child has lice, this infestation is not a huge deal and can be easily treated. Head lice are small insects that cling to human scalps and necks to feed on human blood. They’re about the size of a sesame seed and attracted to our distinctive human smell. If you are able to disguise that smell with shampoos that repel lice, that’s a great way to fight it. Because essential oils are very fragrant, they’re also a great option to disguise our scent and keep lice away. Note: There is no scientific evidence that essential oils can prevent lice. Although people who use these methods have found success, please be careful when using these materials and methods. They also haven’t been tested to FDA standards. If this doesn’t work, you can use shampoos to counter the lice. Make sure to contact your doctor before trying new treatments to eliminate lice. They'll be able to provide additional information based on factors that are specialized to you. Use essential oils with lice-repelling/killing properties! What Are Natural Remedies to Eliminate Head Lice? Can coconut shampoo prevent head lice? You can easily incorporate coconut into your bath products to keep head lice at bay. If you don’t want to DIY anything, you can use a coconut-scented shampoo or conditioner. Otherwise, add a few drops of coconut oil to regular soft shampoo. Coconut oil repels but doesn’t prevent, head lice. Why is coconut oil a good product to use? Can tea tree oil shampoo prevent head lice? Tea tree oil, also known as melaleuca oil, is most effective if you already have lice on your head. However, because any lice you catch will be killed by tea tree oil, the essential oil can also work to prevent head lice. You can use a manufactured tea tree oil shampoo or add a few drops of it to your regular shampoo. Keep in mind that using the oil has side effects that can be harmful to your health. A study of tea tree oil's effectiveness in killing head lice found that, at 1% concentration, the oil killed 100% of head lice after 24 hours. Get a small bottle and fill it up with shampoo. Add a drop or two of tea tree oil. Test a small amount on the scalp, and wait a day to ensure that it does not cause irritation. If no signs of irritation are visible, you can add another drop or two to the bottle of shampoo if desired. Alternatively, you can put a few drops of tea tree oil behind your ear or on your neck. If you use a manufactured shampoo with tea tree in it, make sure it contains about five drops of pure essential oil per ounce of shampoo. 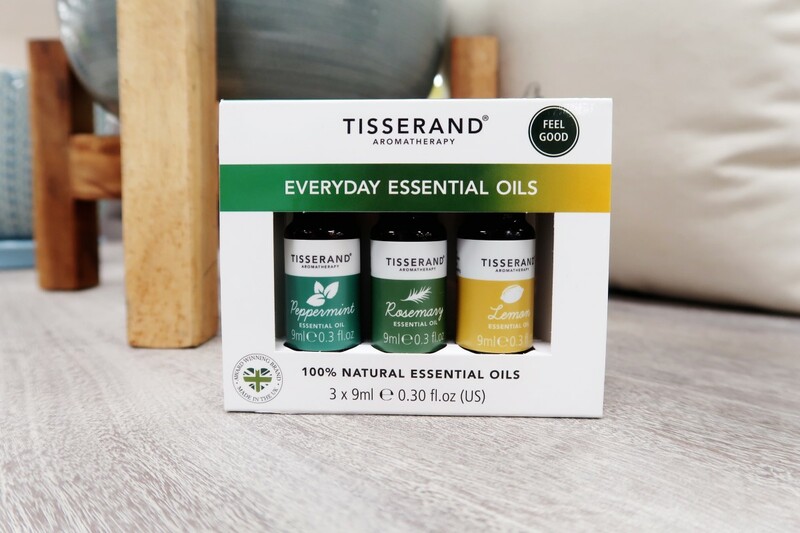 Why is tea tree oil a good product to use? Note: Make sure to test if you’re allergic to tea tree oil. Pure tea tree oil that is applied directly to the skin can cause irritation, blistering, or itching. As such, young children and women, pregnant or breastfeeding, should not use this method. Don’t do this daily. 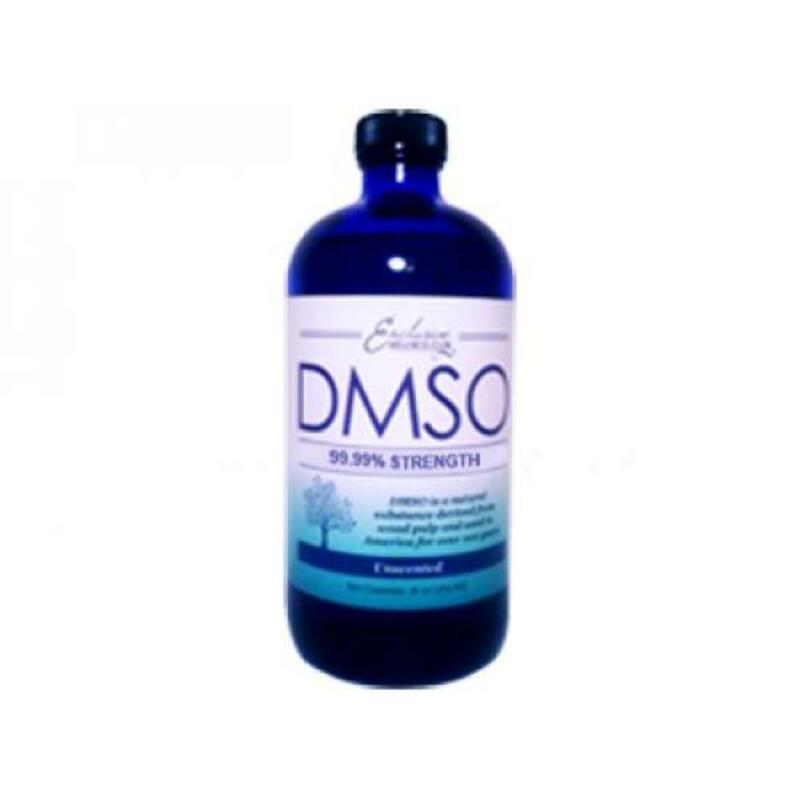 Some people find the pure oil irritating to their skin, so you may want to consider diluting it with a carrier oil. Examples of carrier oils are olive, almond, sesame, and coconut oil. Can lavender oil prevent head lice? Lavender oil is excellent at preventing head lice. 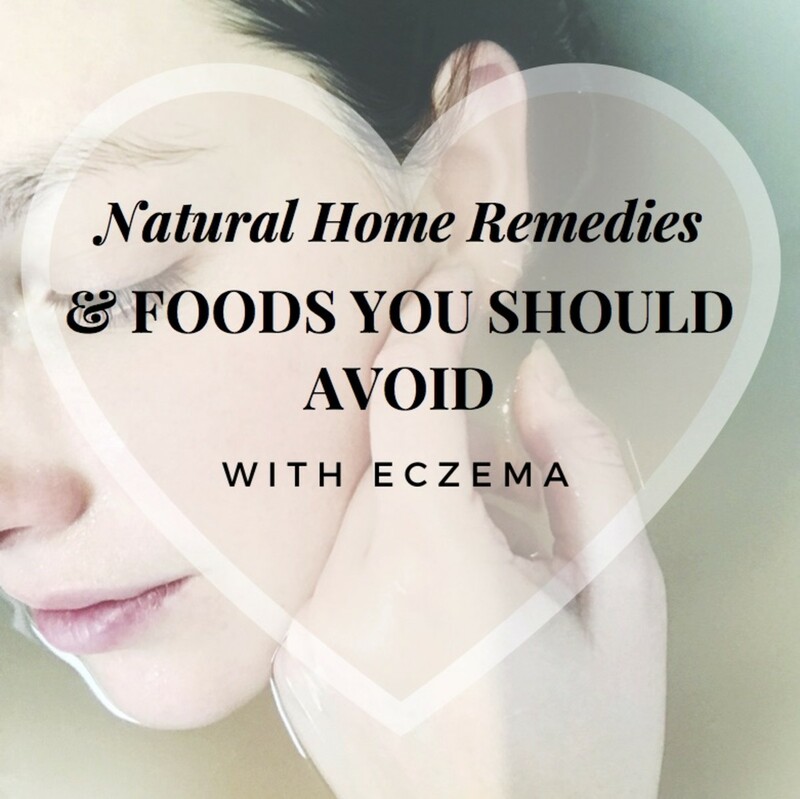 It’s also a great option because it provokes few skin irritations and doesn’t cause as many side effects as other natural methods. Use this only to prevent head lice, and do not use it every day. A study was done comparing the efficacy and safety of three different lice treatments: a mixture of tea tree oil and lavender oil, a life "suffocation" product, and a product with pyrethrins and piperonyl butoxide. Why is lavender oil a good product to use? Can eucalyptus essential oil prevent head lice? Eucalyptus essential oil mainly contains eucalyptol, which is commonly found in antiseptic mouthwashes. Eucalyptus has been found to repel head lice, but it should not be used on children younger than five years old. 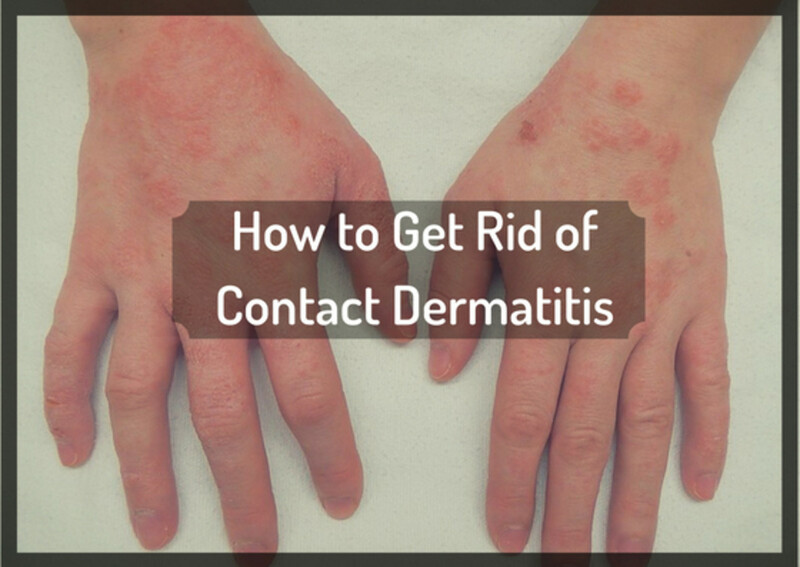 Avoid contact with your eyes and areas where your skin is sensitive. Are there any other essential oils that prevent head lice? Rosemary essential oil contains antiseptic properties that can help prevent a head lice infestation. Lemongrass and citronella oils can also help this, but keep in mind that the use of oils to prevent head lice is unregulated. Peppermint oil has a strong flavor that helps hide the human smell and keep lice away from the scalp. 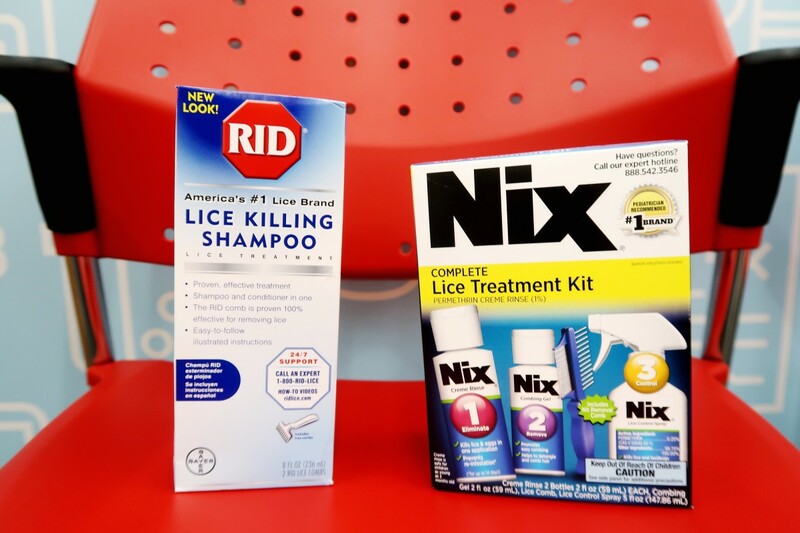 Use a commercial lice-killing treatment. The main treatment options are Rid and Nix. They contain chemicals from a class of chemical compounds that are called pyrethrins. The shampoos work because these chemicals interfere with the pests’ nervous systems and kill them. You can find both Rid and Nix in most pharmacies, and the costs don’t differ much between the two of them. Rid does contain an ingredient called piperonyl butoxide, which the Environmental Protection Agency classifies as a potential cancer-causing agent. However, the strength of it in Rid is only 4 percent— this level is considered to be safe for limited times of exposure. Nix does not contain this ingredient. Note: You should ask your doctor about whether the lice in the area you live have developed resistance to the products you are thinking of using. Don't use Rid on people under two. Apply the shampoo to dry hair. Leave it on for 10 minutes. Add some warm water to your hair and rub your head with your hands to create a lather. Use a fine-toothed comb to remove the lice and nits from your hair. Wait seven to 10 days to repeat this process. 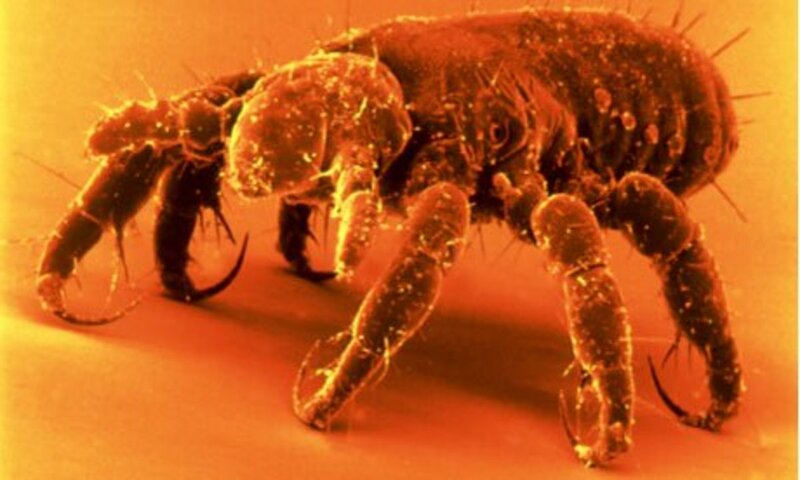 This will kill any lice that may have hatched since the first treatment. People who are two months or older. 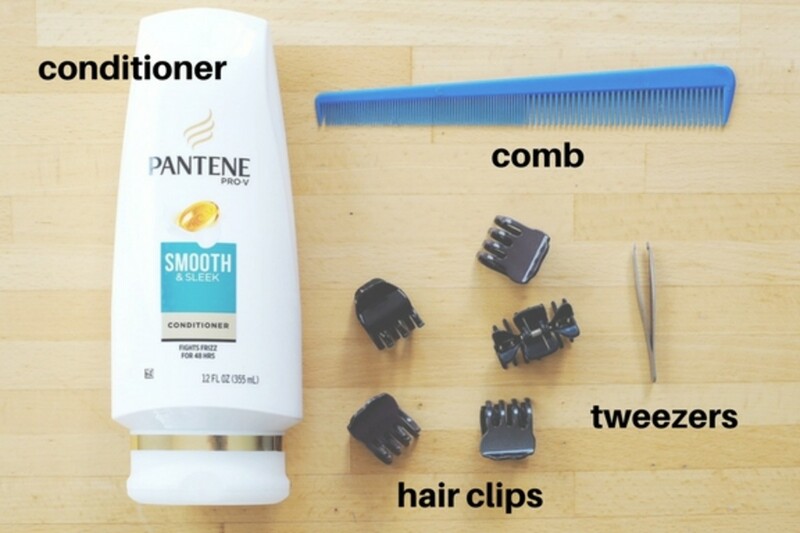 Apply Nix to hair that has been freshly shampooed. Do not use conditioner. Thoroughly coat your hair and scalp with it. Rinse out the product with warm water. Use a fine-toothed comb to remove lice and nits from the hair afterward. Check seven to 10 days to check for new lice that may have hatched since the first treatment. Remove any articles of clothing that might become wet or stained while you apply the treatment. Follow the package instructions to apply the lice medicine. Keep in mind that if you have longer than shoulder-length hair, you may need to use a second bottle of treatment to thoroughly attend to the lice. Wait 8-12 hours to check for live lice. Remove all lice out of your hair with a fine-toothed nit comb. Note: If the medicine doesn’t work and the lice aren’t dead, ask your doctor to see if they know what will work most effectively for you. Put white vinegar in a spray bottle. The vinegar should help loosen the adhesive that attaches the eggs to the scalp. Section off your hair with clips. Spray the hair with the vinegar. Comb through the sections of hair with a fine-toothed comb. Remove the nits and lice. Gently pull out the lice by hand—you can do this with the nails of your thumb and index finger. Slide the lice down the hair shaft until you get them to the end of the strand. Use a black cotton cloth with low nap (little raised surface) to wipe them off. Once you’re done removing them, seal them in a resealable plastic bag that you can throw away later. Tip: Acrylic nails don’t seem to work as well with this method as natural nails. Thoroughly saturate your hair and scalp with conditioner on dry hair. Comb the conditioner through your hair with a detangling comb to evenly distribute the product and remove knots. Get a comb with a tail and use the tapered end to divide the hair into four sections. Use hair clips to keep them in place. Clean one quadrant at a time. Do this by removing the clip and using the tail-pin comb to section off a small horizontal section at the bottom of the hairline. Clip the rest of the section out of the way. 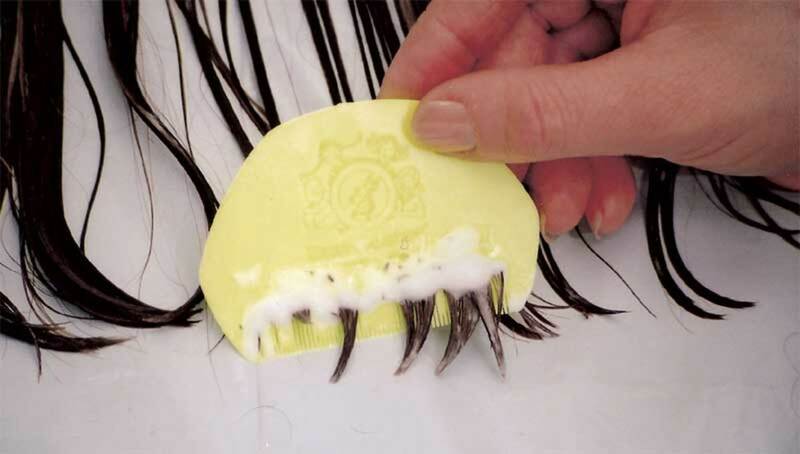 Place the lice comb as close to the hair roots as possible. Pull the comb all the way down, from root to tip. Don’t just do this over the hair, but brush the underside as well. After you comb each section, wipe the conditioner off the comb onto a clean white cloth. Spread it out to see how many eggs and live lice you find to help you monitor the progress. Check the section of hair you combed through once more to see if anything remains. If you see anything, comb through the hair or use tweezers to remove it. Once you’re done, continue taking small sections of hair and working through it to finish the one section. Comb through it several times to make sure everything is taken care of, and clip it back up to move to the next quadrant. When you’ve finished the four sections, remove the clips and comb through the areas. Continue wiping the conditioner on a white cloth and inspect the product for remaining lice. Rinse out the conditioner and style the hair as you normally would. Soak everything you used in hot, soapy water. Wash the towels and rags used in hot water, and dry them on a hot setting in the dryer. Repeat these steps every three days until you’ve combed through your hair and don’t find anything on two separate days. The two instances should be seven to 10 days apart. If there is a head lice infestation at your child’s school, make sure to take active preventative measures. 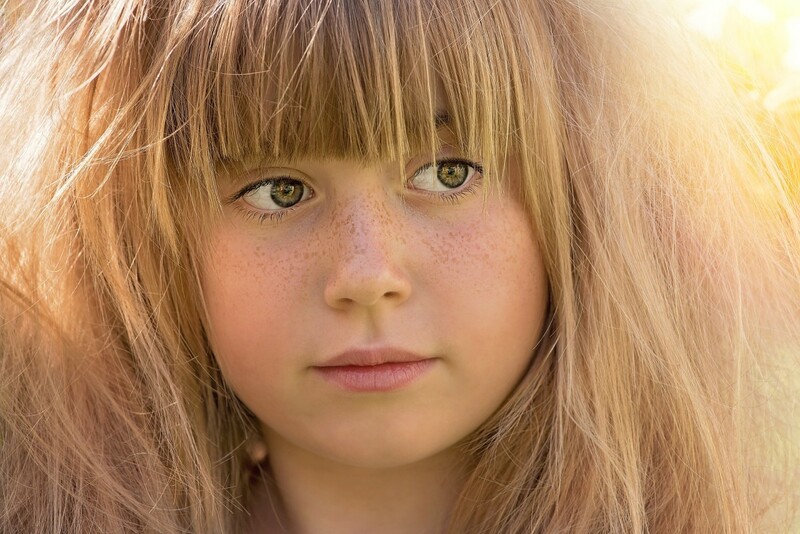 Examine your child’s hair for nits or lice eggs. Do this once a week, and make sure to look at the back hairline and behind the ears. This is where lice tend to populate. Inspect their clothing, especially hats, tops, scarves, and jackets that have been worn during the last two days. Look for lice and eggs. Know that lice can live for one or two days without being on a human head. Move on to check items around the house that can get infested with lice or eggs. This includes bedding, towels, toys, and rugs. Spray lice-protection spray on their hair, clothing, and anywhere else your child may have touched if you suspect they’ve been exposed to lice. You can make one using essential oils that lice can't stand. Just add 12 drops of tea tree oil with 2 ounces of filtered water in a spray bottle to create a prevention spray. Use the dryer to kill any lice that may be on bedding, pillows, and stuffed animals. Throw them in for at least 15 minutes. Soak their brushes, hair ties, and headbands in bleach overnight. Vacuum the floor and any furniture where lice may be found. Do a deep clean with the vacuum once a month. If your child has long hair, put it up in braids or buns to keep it more contained. Kids will be kids, and as kids, they’ll play. Advise them to take these precautions to prevent the spread of head lice. Don’t share items that touch your head, like combs, hats, brushes, hair clips and accessories, helmets, scarves, coats, earbuds, and towels. Remind your children not to share personal items with other children. Take the time to talk to them about lice and how a friend or classmate may not even know that they have it. Make sure to specify items that may come in contact with another child's head, such as hats, coats, scarves, hair brushes, hair accessories, etc. Children are quick to defend their friends. During this conversation, it should be made clear that you are not trying to be mean, and that you like their friends, but they may have lice and not know it. Or they may accidentally share something with another child that has lice. If a child thinks you are being mean, they are less likely to listen to you and may use their friend's brush or hat, thinking that you are simply being mean. Tie long hair in a ponytail or braid. Contrary to what some believe, lice do not jump from one head to another. 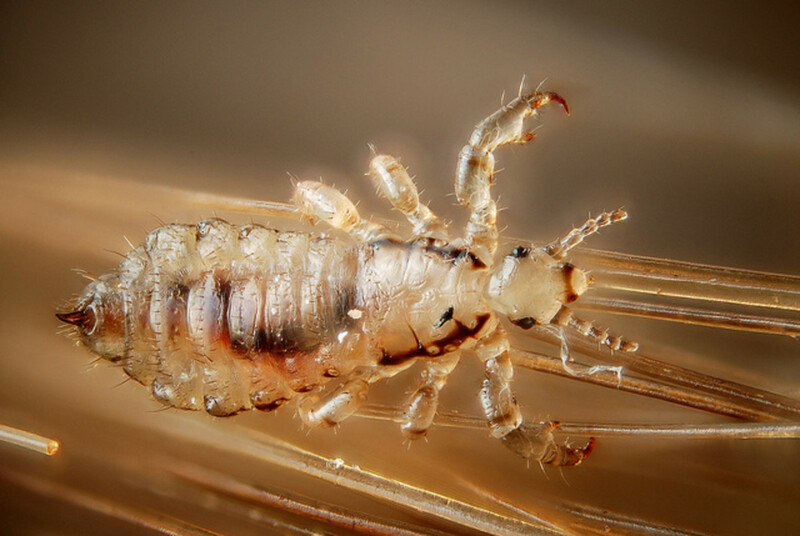 Instead, lice crawl from one head to another head or an item that has come in contact with the head. If a child has long hair, it often falls over when they bend over and can easily come in contact with another child's head. Pulling their hair back can prevent this from happening. 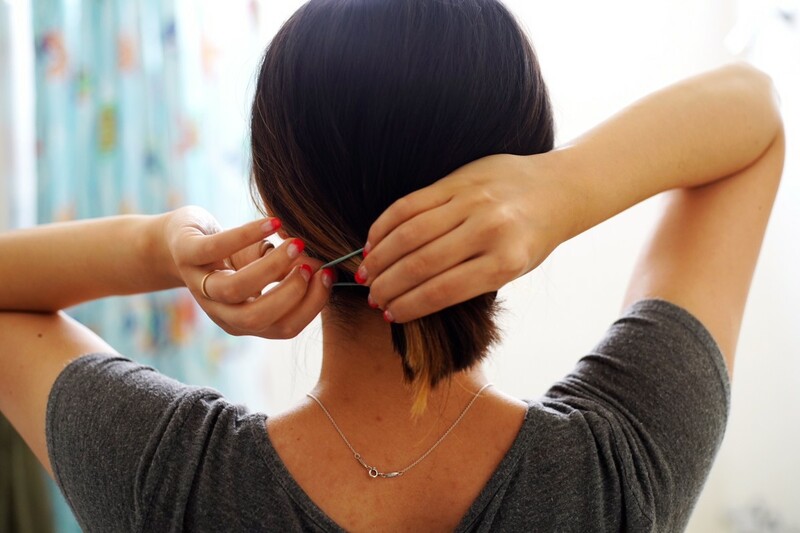 Some great ideas are to pull it back in a ponytail, cut it shorter, or braid it. After you pull the hair back, you can put hairspray in their hair for added protection. Use hairspray and gel. Lice move by crawling up the hair shaft. In order to do that, they have to be able to cling to the hair. Using gel, hairspray, or other hair products can make the hair stiff, preventing lice from being able to crawl on the hair. Tolerate greasy-looking hair. Using oil or vaseline on hair, perhaps with hairspray or gel, can keep lice from being able to cling to and crawl up the hair. The only downside to oiling the hair is that it can make your child's hair look greasy. Certain hairstyles, such as a nice French braid, can help disguise greasiness so it is less obvious. Dye your hair. This works for both adults and children. Because of the chemicals that dye puts on the hair, lice don't like it as much—they like hair that is all natural. Lice prefer an environment that is clean and chemical-free. By taking away either of those things, you are helping prevent head lice. Sleepovers are heaven for lice. With these extra precautions, you can be sure your child is much less likely to experience a lice infestation. If it's at your house, make sure that the children sleep in a star shape, with their feet in the middle and their heads going outwards instead of with all of their heads in the middle. This will ensure that five heads are not all touching at once. Ensure that each child has their own pillow and blanket. It's a great idea to have them bring their own from home, stating that you simply don't have enough for all of the children. While many parents will send these with their child anyway, some may not. If a child doesn't have their own, however, it's not a big deal. You can quickly throw them in the dryer the next day, just to be cautious. Put away your child's hair accessories and hairbrush or comb before everyone gets there. When little girls play dress up, they are quick to simply use their friend's stuff. Even after the dress up stage has passed, it's still pretty common. If you take a couple extra minutes to put away hair brushes and accessories, this won't be an issue. Don't be too embarrassed to look at a child's hair. It can be embarrassing for both your child and their friend for you to look through a child's hair if they are scratching their head. A more subtle way to do this is to offer to braid their hair or pull their hair back. If you do find lice in a child's hair, a discreet phone call can be made to the child's parents. Remember, it is not the child's fault they have lice. Calling their parents or talking somewhere that the other children can hear may embarrass them. It’s good to check for lice for a few weeks after each treatment. Check your hair and comb it with a nit comb to remove nits and lice every 2-3 days. This will likely help to decrease the change of reinfestation. Do this for 2-3 weeks to ensure every last louse and nit is gone. Egg/Nit: Eggs are typically found at the base of the hair shaft near the scalp. They’re about the size of a knot you create with a strand of thread, which makes them hard to see. 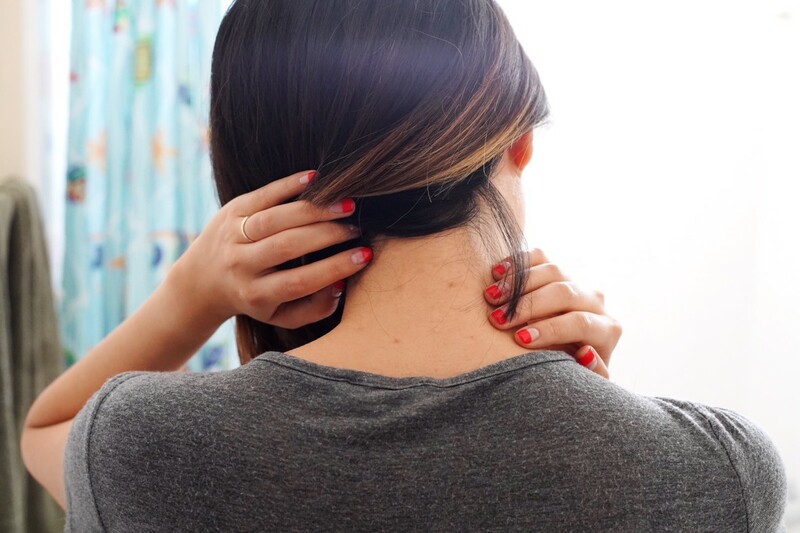 The color is typically white or yellow, but live nits can sometimes look like the same color as the infected person’s hair. Eggs removed from a human scalp will die within a week. They can’t emerge from the egg at a temperature lower than the one close to a person’s scalp. This means that the odds of getting infested with lice from a wig or hairpiece are very low. Nymph: An immature louse that has just emerged from the egg is called a nymph. It looks like an adult but is smaller in size. It needs to feed on blood to survive. The louse stays at this stage for about nine to 12 days after hatching. If they fall off a person at this stage, they will only survive a few hours. Adult: A fully developed louse is the size of a sesame seed. It varies from tan to grayish-white in color. The lifespan is about 30 days but is shortened to a day or two if the louse falls off a person. Females are typically larger than males and lay up to six eggs a day. I hate head lice. Thanks for these helpful tips on helping me and others prevent the pesky creatures.